Villarreal and Red Bull Salzburg are two of the few European teams that are leading the resurgence of the 4-4-2 after the formation became very rarely used in top-level teams in the late 2000’s/early 2010’s. Despite having a similar base shape, the two sides use different systems and have different philosophies which made this a fascinating tactical battle. Villarreal talisman Bruno Soriano was absent due to injury while Salzburg were playing only their second competitive match after losing Alan and Kevin Kampl in the transfer window. Anybody that thought Salzburg’s philosophy would be changed after Schmidt left for Bayer Leverkusen in the summer were wrong. Adi Hütter has kept alive Schmidt’s attacking, high-pressing, counterpressing, vertical style. A positive of playing a system with two centre-forwards and two wide midfielders is that it allows you to press the opposition’s back four 4v4. Also, the two no. 8s of Salzburg could stay tight to Villarreal’s 8s. Villarreal struggled to cope with this in the early stages and were forced to play long balls, resulting in frequent loss of possession. Also, Salzburg’s wingers being so wide in the defensive phase obviously gives them a huge advantage in the attacking transition should they win the ball. This high press was almost exclusively performed when Villarreal had the ball in their own half, Salzburg adopted a Man-Orientated Zonal Marking system during the latter stages of Villarreal build-up. The wide midfielders teamed up with the fullbacks when Villarreal had the ball in wide positions to press them, using the sideline as the third defender. Villarreal’s winning goal exposed two facets of their defensive play. Firstly, was the interesting positioning of Sabitzer when Villarreal had the ball on their right flank. He took up a narrow, slightly more advanced position. Possible explanations for this are 1) to block a switch 2) to be within range of Pina to press him if he receives the ball, or 3) to be able to act as a link to the forwards in an attacking transition. Ironically, a clearance to Musacchio followed by a switch to Cheryshev exposes an isolated Schwegler 1v1. 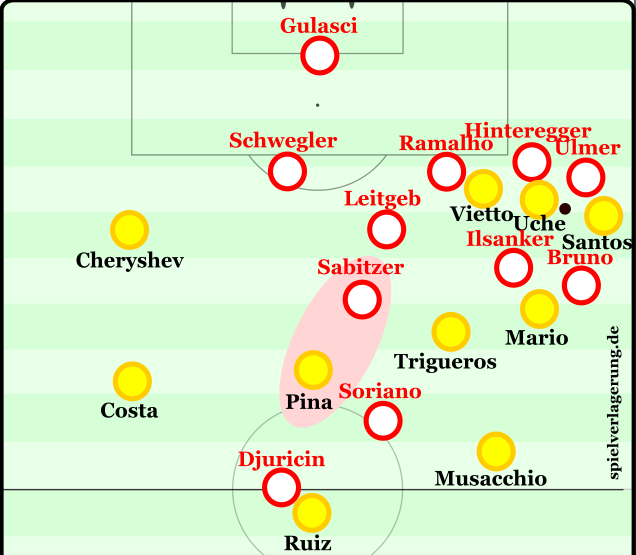 The second facet was the Salzburg fullbacks’ tendency to apply close pressure to Villarreal’s wide midfielders, leading to a bowl-shaped back four. This diagonal distance between Schwegler and Ramalho allows Cheryshev to play a one-two with Vietto and make it 2-1. All of this is shown below. Sabitzer is positioned in a central, more advanced area. Mussachio’s switch leaves Salzburg’s left side vulnerable. Schwegler being diagonal to Ramalho allows Chershev and Vietto to play an easy one-two. This bowl shaped back four was most vulnerable when defending long balls as the fullbacks would push higher up the pitch onto the Villarreal wide midfielders. This would then leave the centre-backs 2v2 with the furthest forward Villarreal men. On one occasion, Villarreal won a knock down from a goal kick and Cheryshev and Uche were 2v2 with Ramalho and Hinteregger. Uche and Cheryshev spread wide, leaving a huge gap in between the centre-backs for Vietto to run into and receive a pass before missing a good opportunity. Contrary to Salzburg, Villarreal played a much deeper defensive block with two lines of four close together. They were narrow but could use the short distance between their two lines as when a fullback went out to close down a wide player, Trigueros or Pina filled in the halfspace. This was a variant of their mostly position-orientated zonal marking system. 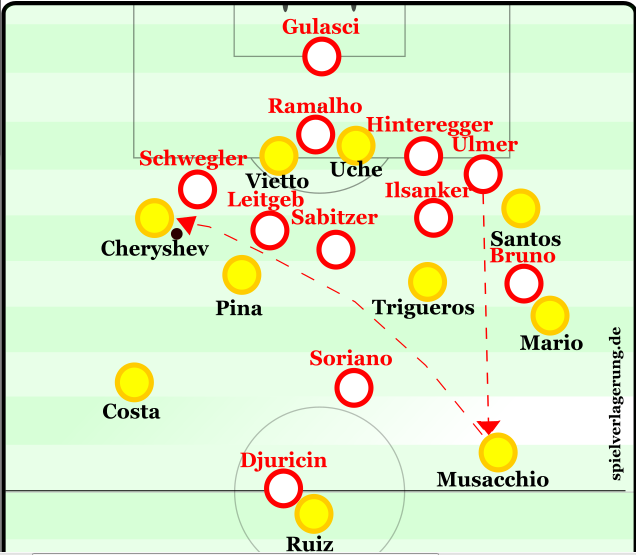 Having said this, Villarreal did well to stop Gulasci playing short to his centre-backs with Uche and Vietto staying very tight to Salzburg’s centre-backs. 29 out of Gulasci’s 33 passes were long passes. Only 13 of his 29 long passes were completed meaning this was a successful situational marking variant from Villarreal. As I have mentioned, Red Bull were forced to play long ball. They found it difficult to use quick transitions and vertical balls to create chances bacause of Villarreal’s very organised deep block. With the ball, they had their CFs and wide midfielders on Villarreal’s back four meaning that they could pull off into the space between the lines and not be followed as this would create gaps in the defensive line. Despite this, Salzburg struggled to get the ball into this area due to the close proximity of the two Villarreal defensive lines. They could use this 4v4 to their advantage as quick underlapping runs from their fullbacks created a 2v1 wide overload which either allowed the fullback be open, or allow the wide midfielder to lose his marker. They didn’t create these opportunities often enough. Playing with such width when they had the ball caused Red Bull Salzburg to be vulnerable in the defensive transition, especially with the lack of a no. 6 which is often commonplace in teams that use attacking fullbacks. Due to Salzburg’s pressing, Villarreal struggled in early build-up. They initially tried dropping one of their no. 8s to collect the ball from their defenders to create a triangle with the RB, RCB and RCM or vice versa. The no. 8s did often collect the ball but were closely followed by their opposite number, causing them to play long or go backwards. Red Bull Salzburg prevented Villarreal from building up through wide areas early in the match, using curved runs from the RM and LM to cover shadow the Villarreal wide midfielders, who were tightly marked by the Salzburg fullbacks. This intensity wasn’t kept up throughout the match and Villarreal managed to get behind Salzburg through wide area on many occasions. Villarreal started build up very deep to drag out Salzburg’s press. With accurate long passes they could penetrate the space behind the fullbacks to utilise the pace of Cheryshev and Santos. The second leg promises to be a brilliant match as Salzburg require at least one goal to progress. They can also afford to rotate in their league matches due to them being 8 points clear at the top of the Austrian Bundesliga. 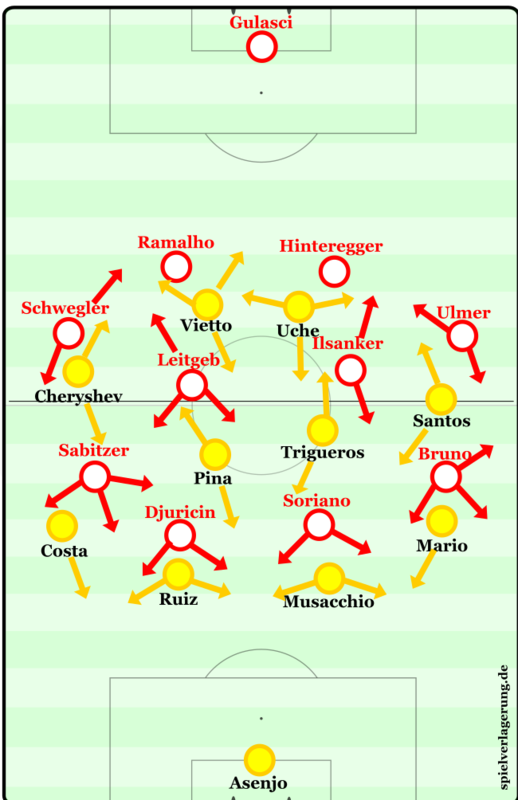 Them match showed two different systems that can be applied to the same formation to produce different results. This will be shown again on Wednesday night in Leverkusen where Roger Schmidt faces Diego Simeone. 4-4-2 is back. This site always has gems in it. Keep up the good work. Am hoping that somehow, Kampl can be replaced at Salzburg. will there be any analyses of this weeks premier league matches? liv sou maybe?